Why don’t you get your health checkup done? Please I don’t want to incur unnecessary expense. I am alright I don’t need any checkup. If anything happens we will see then. Aren’t we all familiar with such conversation? We Indians generally have this mindset that we will go to doctor only if we are really ill. But I think with changing times it’s a necessity to change this mindset. Recently one of my friend got his parents checkup done. It was a routine checkup and he discovered that his mother had high cholesterol problem that could damage her heart. Even I was shocked as I have seen his mother and she seemed healthy to us. It’s important to get health checkup done from time to time. If it’s important to get checkup done than utmost important is to get it done from a reliable institution. I discovered recently that Thyrocare is doing great job in terms of providing health checkup services. First and foremost easiness for booking. I can never have imagined like five years back that we will be able to book for checkups via WhatsApp or email. You have to call or WhatsApp or email to Thyrocare. They also have an app that you can download on your phone and make your life easy. After receiving your service request Thyrocare personnel will get in touch with you so as to fix date and time for sample collection from your doorstep. Isn’t that great thing to do? You can schedule it during your office hours as well. One of my colleague did that recently. Qualified technician will come for sample collection including blood sample. Then the samples are sent to Thyrocare laboratories and reports are generated within 48 hours and are emailed to customer. For customers who wish to receive hard copies for test have to pay just Rs. 35 over and above package cost. Now I am sure you must be worried about it being a costlier affair. In fact I also thought the same. But as they say never assume, always check the facts. 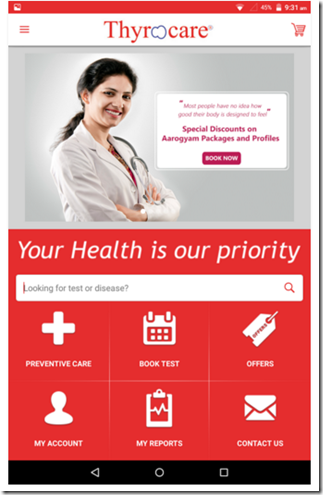 You can’t believe their Aarogyam packages starts from Rs. 600 to Rs. 2,200. Not only this if you can avail great discounts on multiple bookings. Like you can book for you and your family. Or even office colleagues can collaborate. Everybody needs health checkup. I opted for Aarogyam B test that covered 71 tests for just Rs. 1,700 that to be from my doorstep. Since me and one of my friend together opted for same tests the fee went down further from Rs. 1,700 to Rs. 1,500 per person. Isn’t that great? After seeing both of us lot of our colleagues have opted for test. It seems like whole office wants to get healthier. Also it saves lot of money and time. We didn’t had to spend on transport cost and it was done within office hours. Isn’t that really convenient? Also if you book via app than you will get further discounts. Click here to download app. It was very convenient to hand over samples and we got our test reports within 24 hours. I am very much satisfied with their services so decided to let you guys know about it. Next time if you wish to get your/family health check-up done don’t go anywhere else just opt for Thyrocare. Ohh I have heard about them but did not know they were good. Thanks for sharing! I was not aware of the fact that Thyrocare offer so much test at such affordable cost. In Delhi I have seen many Thyrocare centers . Near my home there is one. I just searched on Google Play they have app too . I have downloaded it is so user friendly. Thank you for your review ! It was so informative!